A sample image recorded by the OTPC detector’s CCD camera showing the particle trajectories. 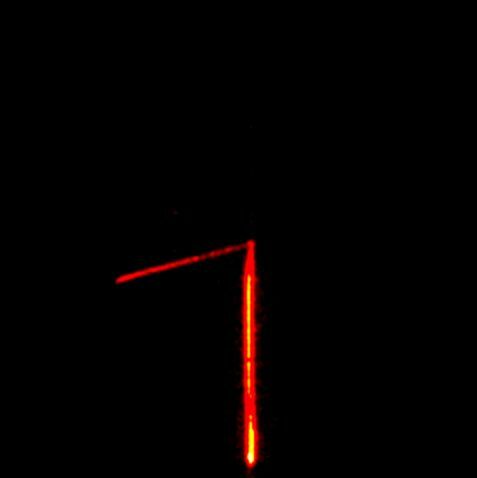 The vertical track corresponds to the 60Ge ion entering the detector and the other track corresponds to the (β-delayed) proton. 60Ge ions was observed by β-delayed proton emission yielding a branching ratio of ~100% and a half-life of 20+7-5 ms. This value agrees well with theoretical predictions. In the context of the Hagedorn temperature half-centenary our understanding of the hot phases of hadronic matter both below and above the Hagedorn temperature is reviewed. The first part of this review paper just published in EPJ A addresses many frequently posed questions about properties of hadronic matter in different phases, phase transition and the exploration of quark-gluon plasma (QGP). The historical context of the discovery of QGP is described and the role of strangeness and strange antibaryon signature of QGP illustrated. In the second part the corresponding theoretical ideas and how experimental results can be used to describe the properties of QGP at hadronization are described. Neutron-proton differential cross section at Elab=143 MeV up to fourth order in the chiral expansion. Chiral effective field theory provides a systematically improvable perturbative approach to deriving nuclear forces in harmony with the symmetries of Quantum Chromodynamics. Combined with modern few- and many-body methods, this framework represents a commonly accepted procedure for ab initio studies of nuclear structure and reactions. In this paper, the authors introduce a new generation of nucleon-nucleon forces up to fourth order in the chiral expansion. By employing an appropriate regularization in coordinate space, which maintains the analytic structure of the amplitude, the authors succeed in significantly reducing the amount of finite-cutoff artefacts. In addition, a simple approach to estimating the theoretical uncertainty in few- and many-nucleon calculations from the truncation of the chiral expansion is formulated. By calculating various two-nucleon scattering and bound-state observables, the authors verify that the results at different chiral orders and for different values of the regulator are indeed consistent with each other and with the experimental data. The new generation of chiral nuclear forces is expected to provide an excellent starting point for applications in nuclear physics. Spectrum of the simultaneous measurement of the H(3p-1s) and the 16O(6h-5g) transitions (top). Energy shift of the ground state at various H2 density (solid diamonds), the open diamond represents the previous experiment when using the latest value of the electromagnetic transition energy. Analogous to the vast amount of knowledge acquired on the electronic hydrogen atom over the last century and the success of Quantum Electrodynamics (QED), hadronic physics is using a similar system, namely “pionic hydrogen” - a hydrogen atom where the electron is replaced by a negatively charged pion - as a laboratory for investigating Quantum Chromodynamics (QCD). Like in electronic hydrogen the finite size of the proton plays a role in the precise determination of the ground state of the atom. The smaller Bohr radius of the pion offers a larger sensitivity to the strong interaction between the pion and the proton, leading, e.g., to an energy shift compared to the ground state energy if only the electromagnetic interaction is considered. The precise determination of this shift provides a benchmark of our understanding of the pion-proton strong interaction from basic principles in QCD. To this end an exquisite experiment was devised and performed at the high intensity, low energy pion beam at the Paul Scherrer Institut using a cyclotron trap and an ultimate resolution Bragg spectrometer leading to an impressive four fold improvement compared to the previous best measurement as shown in Fig. 1. Subtracted DR prediction for the elastic cross section. The subtraction constant, denoted by ε0, is fitted to data (blue band from the A1@MAMI Coll.). Elastic electron-proton scatterings (with one-photon exchange) have always provided fundamental information on general properties of the proton. Recently, two experimental approaches, with and without polarized protons, gave strikingly different results for the electric over magnetic proton form factor ratio. Similarly, a mysterious discrepancy (“the proton radius puzzle”) has been observed in the measurement of the proton charge radius in different experiments, one of which is electron-proton scattering. Two-photon exchange (TPE) contributions have been proposed as a plausible solution to resolve the puzzles, but their estimates have strong model dependences. A quantitative understanding of TPE effects, based on general principles and avoiding model dependences, is necessary. A subtracted dispersion relation formalism for the TPE has been developed and tested. Its relative effect δ2γ on the elastic cross section is in the 1-2 % range for a low value of the momentum transfer Q2 as function of the kinematic parameter ε, ranging between ε = 0 (backward scattering) and ε = 1 (forward scattering). Sequential two-proton decay of the 16Ne Er=7.57 MeV state. The fractional energy distribution (left) gives resonance energy in 15F while the angular distribution (right) determines Iπ of the initial state. Hitherto three-body correlations between decay products of nuclear resonances, unstable to the emission of two neutrons have been a very effective tool in the analysis of GSI-experiments on 5H, 10He, 13Li, and 14Be. Here the first report is given about the mechanisms for two-proton emission from states in 16Ne, representing the presently most complete study of this nucleus. One-neutron knockout from 17Ne populated the 16Ne(g.s.) (Er=1.39 MeV, Γ=0.08 MeV) above the 14O+p+p threshold, and resonances at Er=3.22 MeV and 7.57 MeV. The decay mechanisms were revealed analysing three-body energy correlations in the 14O+p+p system. It was found that the 16Ne(g.s.) undergoes a democratic three-body decay. In contrast to this, the 16Ne(21+) state emits protons through the 15F(g.s.) sequentially. The decay of 7.57 MeV state is well-described assuming emission of a proton from the d5/2 shell to 15F(5/2+), which decays by d5/2 proton emission to 14O(g.s.). By using R-matrix analysis and mirror symmetry this state was unambiguously identified as the third 2+ state in 16Ne. EPJ A Highlight - Achieving high resolution in binary nuclear reactions with outgoing fast neutrons – at last! 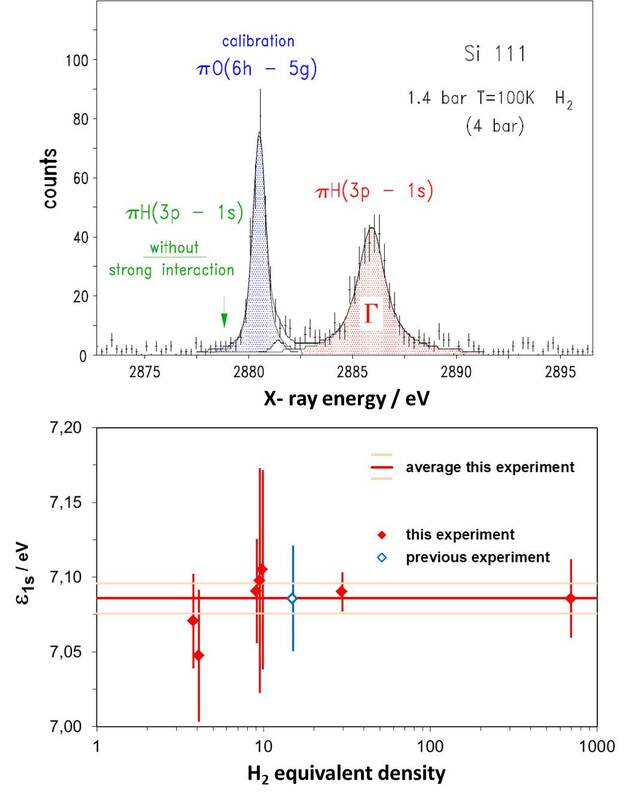 To date, the two-nucleon pick-up and stripping counterparts of the (p,t) and (t,p) reactions, the (3He,n) and (n, 3He) reactions, have been poorly investigated due to the difficulty in performing high-resolution measurements of fast-neutron energies. The best time-of-flight (3He,n) measurements report resolutions not better than 250 keV. This lack of experimental resolution has hindered a full understanding of the role of proton pairing in nuclei. Density profile of the collapsed state of 10000 neutrons in the X-Y-plane along the symmetry axis Z=0 (schematic illustration). Polarized neutrons, which interact through incorrect three-body forces, concentrate in small spheres separated by 0.9 fermi. © Dmitry K. Gridnev et al. Nuclear systems ranging from light nuclei to massive neutron stars can be well described by nucleons interacting through two-body and three-body forces. From electrostatics we know that two identical uniformly charged spheres repel at any distance but the repulsion disappears when the spheres completely overlap. Similarly, in some modern expressions of nuclear three-body force it is assumed that the nuclear repulsion between the three nucleons is zero when they occupy the same position in space. While the strong force is well understood at high energies in terms of perturbative QCD, the precise mechanism responsible for the confinement of quarks and gluons in color-neutral hadrons at low energies remains a mystery to date. The intermediate energy region is characterized by rich and complex spectra of excited baryons and mesons. Its phenomenology provides a key to our understanding of the fundamental properties of matter. Intensity of the 2-+ partial-wave in π^- γ→π^- π^- π^+, interpreted as radiative width of the π2(1670). Radiative transitions are among the most important and insightful processes for the investigation of atomic, nuclear and hadronic systems. They reveal the electromagnetic substructure of the involved particles. The a2(1320) meson is known since the 1980s to decay radiatively with a branching of about 0.3% into a pion and a photon. Theoretically this can be linked, for example through the vector meson dominance model, to the main hadronic decay channels.